The AAA is very pleased to be able to post this paper, below is an excerpt. The full text can be found here. The history of English education is very much a history of social class. The 1944 Education Act, the wartime government’s response to the great evil of ignorance, did little to interrupt that history. Rather it brought about a very modest loosening of the relationship between social class and educational opportunity. This was partly in relation to the raising of the school leaving age and partly by allowing some working class students access to grammar schooling via the 11+ examination system. Despite the shortcomings, 1944 was a significant moment in state education in so far as it represented the clearest, although still equivocal, commitment of the state to responsibility for compulsory educational provision. An educational ‘settlement’ was set in place for the period 1944-76 but it was a shaky and unstable settlement. This made thoroughgoing comprehensive reform difficult, if not impossible. Both the New Labour (1997-2010) and Coalition Governments have worked to unpick the idea of direct responsibility for the delivery of educational services. The current system of education in England is beginning to resemble some aspects of the pre-1870 system of education. The distribution of responsibility for the solution of social problems is changing and now philanthropy and business are essential parts of the delivery and policy processes of education. The Conservative Governments of 1979-97 and Labour and Coalition Governments have all been keen to displace the participation of teacher associations, trade unions and local authorities from the policy process. Furthermore, the introduction of new kinds of schools has enabled a gradual dismantling of national pay and conditions agreements for teachers and a concomitant move towards individual contract arrangements for teachers and other school workers. The more fuzzy and patchy the system of schools, the more difficult it is for those without the ‘right’ cultural assets to navigate their way through. Concomitantly some schools are using their ‘freedoms’ to deploy subtle forms of selection. Competition between schools articulated through league tables based on output indicators has produced an ‘economy of student worth’. In these respects, the relation of supply to demand in the education market is dysfunctional. Pedagogy and classroom decision-making are driven by the overbearing emphasis on performance. Outcome measurement and teaching and learning are distorted by the fears of measurement and comparison. Despite the relentless and repeated criticisms of state schooling and the ongoing reform of the school system, the relationships between opportunity, achievement and social class have remained stubbornly entrenched and have been reproduced by policy. Inequalities of class and race remain stark and indeed have been increasing since 2008. In response to this we have to reconnect education to democracy and work towards an educative relationship between schools and their communities. Put simply “we should recognize the centrality of education to larger projects of democracy and community building”. Among other things schools should have a responsibility to develop the capabilities of parents, students, teachers, and other local stakeholders; to participate, to discuss, to challenge and critique. It is time to get back to basics – to think seriously about what is the purpose of education and what it means to be educated, what schools are for, and concomitantly and crucially who should decide these things. It is clearly necessary to dismantle systems of assessment and related incentives that encourage schools to focus their attention on some students and neglect others. Forms of assessment which rate students according to standardised age-related criteria that encourage ‘teaching to the test’ and ignore that children learn at different speeds and in different ways should be done away with. We need to engage students in discussing and designing purposeful and meaningful systems of assessment. All of this, would also mean addressing directly, and in practical ways, the complex and difficult relations between education and poverty and reworking “the tangled and confused nexus between the new realities of adolescent lives, and the out-oftouch realities of educational policy regimes” in sustained and different ways. Fundamentally, this means moving away from the idea that there is a simple and inevitable relationship between social background and something called ability. Rather than blaming teachers for low expectations or parents for lack of aspiration, we need to think about the social conditions that make effective learning possible, at home and at school. Once those conditions are met we can begin to think more about the role of expectations and aspirations. What are needed are forms of radical incrementalism based on “consultative and participatory processes”. 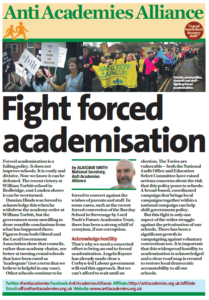 This is not however a proposal for tinkering and compromise, it is a process of re-starting policy from a different set of organising principles – a staged but unequivocal abandonment of the current education policy infrastructure. The political process of rethinking education for the 21st century, related to real social needs and economic problems, will only come about by unleashing the innovative potential of schools, teachers and communities; by building and exploiting a proper sense of “democratic fellowship”; and by rebuilding trust in teachers and schools. Such changes will require a new kind of teacher and a move towards forms of democratic professionalism⁶, with an emphasis on collaborative, cooperative action between teachers and other educational stakeholders. Which in turn means that teachers, parents and students will have to accept challenges and demonstrate a readiness to lead and adapt. There are many risks and costs to be borne here, and there will be failures and deadends. This entry was posted in News, Research, Resources and tagged Councils. Bookmark the permalink. This is a very interesting paper but it has one worrying omission. In the 16 pages of the second part, where Stephen outlines his alternative, he does not once speak of local authorities. He refers to ‘Re-establishing local democratic control’ (p37), but his only proposal is for a return to directly elected school boards, with no reason given as to why they might be preferred to local authorities (which have the advantage of integrating education into the whole of council policy and provision), and no suggestion that they might be opened up to include the participation of stakeholders. 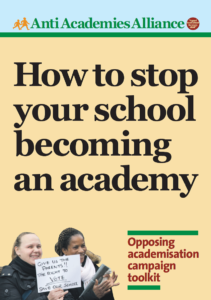 In a complementary article in the Guardian (24 October) Stephen states that ‘We need to reconnect education to democracy and work towards a relationship between schools and their communities. We should recognise the centrality of education to larger projects of democracy and community building.’ But it is clear from what follows that he restricts the meaning of local democracy to the level of the school. 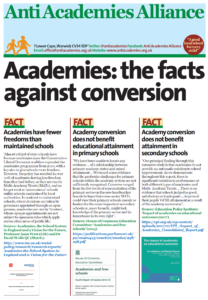 ‘This is not about the re-invention of local education authorities. This is about communities, parents and students having a say in deciding what, how, and by whom they are taught…’. This is a false counter-position, and a dangerous one at a time when there is currently a concerted effort by politicians and others to expunge local authorities from the policy vocabulary and replace them with non-elected ‘middle tier’ alternatives. A case in point is Estelle Morris (Guardian 22 October), who manages to argue for local coordination in the school system without once risking using the term ‘local authority’. Our response should be that we need participative schools, and we need re-purposed, democratised and participative local authorities which play an educational coordinating and leadership role in a new partnership with schools and communities, for two reasons: schools can’t do it on their own, and the whole local community should have the right to representation in local area-wide education policy decisions. It’s what I think Fielding and Moss mean when they advocate, in a quotation which is the one reference to local authorities in Stephen’s alternative, ‘networks of small, age-integrated and self governing schools serving local communities and in a close, mutual and democratic relationship with their local authorities’ (p29).